A few days ago I shared with you a Halloween card that I made. Today I want to share with you another card that I made using the same stamp set but a slightly different technique. But I have to be fair! On this card I had a lot of help from the second member of the SnS team! We finally found some time to actually sit down and create a few cards together! 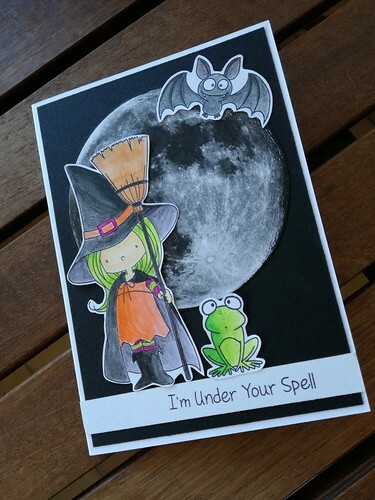 And I have to be honest…the cards that we make together are always my favourite! 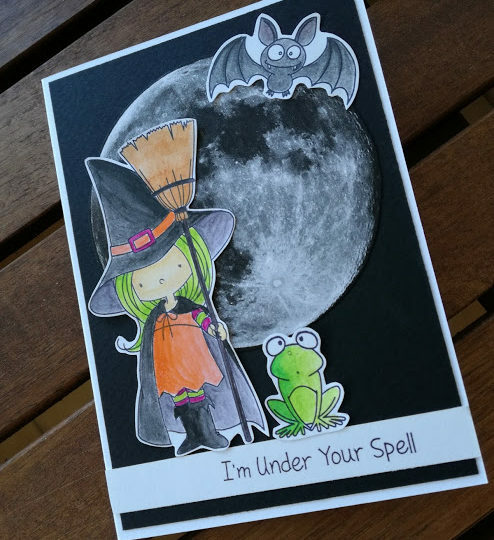 So we wanted to make another Halloween card and we decided to use again this adorable witch from the “Witch Way Is The Candy” stamp set. We had the idea of having her standing in front of a big and spooky moon. But after going through our stash for several times we realized that we had no stamp or die whatsoever that we could use as a moon. So we thought to look on-line and find one in order to print it and use on our card. So we googled spooky moon and clicked on the images. There were a bunch of beautiful moons to choose. We went for the one that we liked the most and we edited it on Photoshop. It just needed a simple size adjustment and it was ready. Then we printed on 120gr white cardstock and it was ready to use. We just die cut it with our circle die. For the background we used plain black cardstock and as usual we cut it slightly smaller that the card front in order to create a white border all around. Then for the focal point we stamped with black archival ink all the images that we wanted to use. We used Inktense Pencils and a waterbrush to colour them in. Then we fussy cut them with out scissors making sure to leave a thin white border all around. This way the look more perfect and the match perfectly with white border on the card front. Since the moon was looking so dimensional we decided to stick everything flat using tape adhesive. And that’s it! We were really happy and exited with this card! It turned out to be one of our favorites! Don’t you love the look of the printed moon on the background! Being able to print elements for your cards gives you endless possibilities! We hope you liked this card! We will see you soon on our next post! Until then….happy carfting!